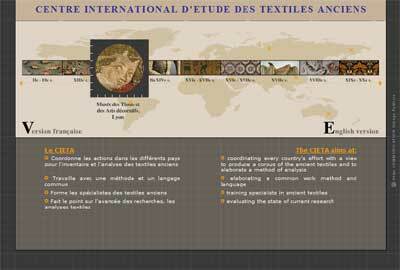 The first is CIETA, Centre International d’Etude des Textiles Anciens – “an international association founded in 1954 in order to coordinate work methods used by specialists in ancient textiles.” The site itself is dedicated to telling people about CIETA. It offers both a French and English version for readers. Essentially, CIETA is devoted to the study of historical textiles, and, as a world-wide organization, it has “fine-tuned” the language of textiles in order to provide consistency in the examination, documentation, and study of historic textiles. CIETA offers technical courses, where the student learns techniques of analysis of textiles. The members of the organization apparently meet every other year in an international congress, and the organization also has several departments for specialized groups within the realm of historical textiles. For those interested in making their life work the study of historical textiles, this looks like a great organization. 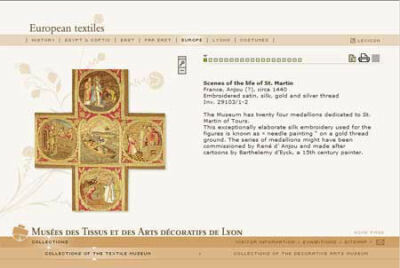 But what was more fun was the link on the site to the Museum of Textiles in Lyons, France. I have to admit, the site itself is rather irritating – it requires activating a lot of controls, if you have pop-ups blocked, you might have to unblock them, it doesn’t allow regular forward-back movement on your browser, and on and on. BUT – despite all that – it’s worth checking out. Once you get into the site, you’ll have a choice between English and French. Under the English option, there’s a link for the Textile Museum Collection. In the menu bar across the top of that page, you’ll have choices of different textiles from around the world, as well as a collection of costumes. The pictures are fun to browse through, even though they are rather stingy with the images – they’re small, and even the enlargements are small. And you can’t maximize the page and get a better view, either! BUT – again – despite that, I enjoyed browsing through the textiles. They have beautiful examples of European, Eastern, Coptic and Egyptian, and local (Lyons) historical textiles. The costumes they have featured on the site are worth looking at, too. So, if you’re interested in historical textiles, here are two sites worth checking out!